1Departamento Ingeniería Forestal. Technical University of Madrid (UPM); E.T.S. Ingenieros de Montes, 28040 Madrid, Spain. 2Departamento Ingeniería Forestal. Technical University of Madrid; U.D. Operaciones Básicas, E.T.S. Ingenieros de Montes, 28040 Madrid, Spain. 3Deparment of Applied Physics. Technical University of Madrid (UPM); E.T.S. Ingenieros de Montes, 28040 Madrid, Spain. There is currently little information available on calcium-soil-ectomycorrhizal (ECM) interactions. However, for decades calcareous amendments have been made in forest soils subject to acid rain in Europe without any clear knowledge of their impact on ECMs and the roots of their host plants. We have therefore performed a review to assess the impact of Ca associated tocalcareous amendments in the soil-ECM-host plant system, which has highlighted: (1) the influence of Ca and its salts (carbonates and oxalates) of biological origin in ECM fungal communities; (2) the impact of Ca on the growth patterns of the host tree roots; (3) the importance for the plants of the rock-eating processes associated to ECMs; and (4) the impact on ECMs of the soil Ca cycle (associated to the litterfall). A greater knowledge of the cause-effect relations between Ca and the soil-ECM-plant system in Mediterranean and temperate forests could have positive repercussions on reforestation projects, actions associated to soil management, the commercial production of ECMs, and the economy of different rural zones in these forest areas. Calcareous amendments have been widely used in agroforestry management both tropical and temperate reforestations. For several decades the forestry industry has intensified its use of calcareous amendments to counteract the impact of acid rain in several forests in north and central Europe, which have a great abundance of ECM fungi. Several authors have warned of the lack of knowledge on the impact of the Ca associated to these calcareous amendments on the rhizosphere of these forests (Gronflaten et al., 2005; Naramabuye et al., 2008; Löfgren et al., 2009; Lee et al., 2011; Monfort-Salvador, 2013). There are known to be negative interactions between excess soil Ca and the processes of chlorosis in plants. A number of researchers have studied this chlorosis in pines, firs, apple trees, vines, peanuts, dwarf beans, green beans, soy, lupins and other plants (García-Montero et al., 2009). The abundance of finely divided calcium carbonate in the soil increases the levels of exchangeable Ca2+ and HCO3- and generates a basic pH, which precipitate P, B, Fe and Mn (Gaucher, 1971; Douchafour and Souchier, 1979; Follet et al., 1981; Loué, 1986; Wild, 1992; Callot, 1999). The most important effect of liming is increase of soil pH, moves out the Al3+ from the cationic exchange positions and hence reduces soil acidity, modify the Cationic and Anionic Exchange Capacity of the soils when they have and "variable change systems" (depending on the isoelectric point). However, calcareous amendments produce also reactions between the Ca2+ and P in the soil solution and in the soil colloids, and also cause secondary Ca carbonate precipitations. The degree of immobilisation of P by the Ca carbonate is inversely proportional to the size of its particles. Adding excess Ca2+ and HCO3- in the soil can cause Mg2+ deficiencies in plants (Follet et al., 1981), and generate secondary calcites that also immobilise Mg2+ (Douchafour and Souchier, 1979). Borja and Nilsen (2009) and Bakker et al. (2000) indicate that calcareous amendments may have a long-term impact on forest rhizospheres, as they have observed that the effects are evident 27 and 35 years after application, respectively. For this reason, more knowledge is also needed on the impact of calcareous amendments on ECM fungi in the forest environment; this has been a matter of increasing concern in the scientific literature in recent decades (Erland and Söderström, 1990; Schneider and Zech, 1990; Antibus and Linkins, 1992; Huettl and Zoettl, 1993; Kreutzer, 1995; Jonsson et al., 1999; Bakker et al., 2000). The present review aims to contribute to the knowledge of the interactions between Ca associated to calcareous amendments and soil-ECM-plant systems, and to assess the potential impact of liming on forest rhizospheres. After calcareous amendments, it has been observed that one of the main effect of the amendments is that they provoke an increase in soil pH (Borja and Nilsen, 2009; Rineau and Garbaye, 2009) (Table 1). Calcareous amendments increase concentrations of Fe, K, Si Ca, Mg and Mn in the soil because of their previous presence in carbonate rocks that constitute the raw material of amendments (Table 1). Rineau and Garbaye (2009) and Rineau et al. (2010b) indicate that in the control plots in their study, the initial concentrations of Ca, Mg and Mn were low or very low. However, after calcareous amendments these three nutrients were the elements whose concentration had increased most. Rineau et al. (2010b) did not observe any change in Na, S and P concentrations after the amendments. Rineau et al. (2010b) indicate that in some plots with acid soils of Fagus sylvatica L. mycorrhized with Lactarius subdulcis (Pers. : Fr.) S.F. Gray, calcareous amendments produced an increase in Al levels in the soil. Qian et al. (1998) made additions of sulphuric acid and calcareous amendments (obtained from dolomites) in formations of Picea abies (L.) Karst. These authors also observed high concentrations of Al in the soil, accompanied by high mycorrhizal activity. In contrast, in several plots of Pinus sylvestris L. and Fagus sylvatica associated with ECM fungi, Rineau and Garbaye (2009) observed a decrease in soil Al concentrations, although they did not venture any explanation of these findings. However, it is necessary to note that the interactions between calcareous amendments and exchangeable Al are a complex question in soil chemistry, strongly dependent on soil genesis and local soil processes. The application of calcareous amendments in natural populations of Pinus sylvestris, Picea abies, Quercus petraea (Mattuschka) Liebl. and Q. robur L. have triggered an increase in the number of roots colonised by ECMs; this appears to be related to an increase in soil calcium carbonate and pH (Erland and Söderström, 1990; Nowotny et al., 1998; Bakker et al., 2000; Borja and Nilsen, 2009). With regard to this effect, Andersson et al. (1996) observed that increased colonisation of ECMs in the host tree roots brings a corresponding increase in the roots,absorption of Ca. In contrast, calcareous amendments have a negative effect on ECM biodiversity. The main ECMs affected by calcareous amendments are acidophilic species which are displaced due to the disappearance of their ecological niches caused by the increase in soil Ca and pH (Erland and Söderström, 1990; Bakker et al., 2000; Borja and Nilsen, 2009; Rineau and Garbaye, 2009). This modification of the ECM community may be harmful to species of ECM fungi under threat of extinction (Kjoller and Clemmensen, 2009). 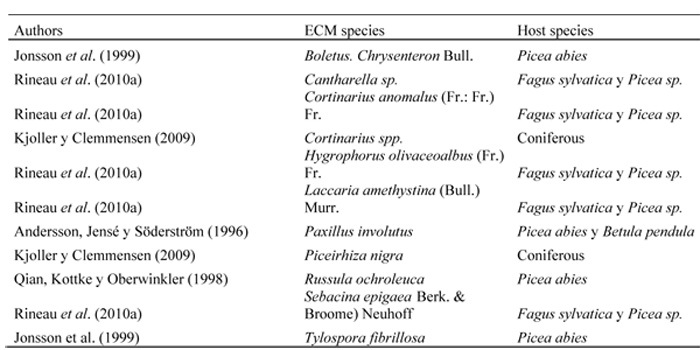 Tables 2, 3 and 4 compare the ECM species that have been affected by calcareous amendments, positively or negatively, compared to the species of ECMs that were shown to be unaffected. The amendments appear to have a different effect on the different ECM morphotypes present in the host tree roots. Mycorrhizas without cystidia (smooth morphotypes) such as Lactarius spp. and Russula spp.decrease their abundance, whereas calcareous amendments appear to have a positive effect on mycorrhizas with cystidia (rough morphotypes), which spread their colonisation to new roots (Bakker et al., 2000). However, Rineau et al. (2010a) observed an increase in the ECMs of Lactarius subdulcis in plots of Fagus sylvatica and Picea spp. (Table 2). The impact of calcareous amendments on ectomycorrhized roots could be due to the fact that increasing doses of calcium carbonate promote meristematic root cell activity and increase the length of the fine roots. This process appears to be related with an increase in drought resistance observed in various trees in plots treated with calcareous amendments (Qian et al., 1998; Bakker et al., 2000; Rineau et al., 2010a). Rineau and Garbaye (2010) and Rineau et al. (2010b) report that the ECMs of Lactarius spp. have the capacity to segregate significant quantities of laccase and calcium oxalate CaOx. In their view this explains the accumulations of CaOx crystals observed around the root systems of trees mycorrhized with Lactarius spp. in plots treated with calcareous amendments. Rineau and Garbaye (2009) and Rineau et al. (2010a) studied the production of fruiting bodies by ECM fungi in plots treated with calcareous amendments, and report that acidophilic ECMs species fruited closer to the stem of the trees where the soil was more acid. These authors propose Russula ochroleuca (Pers.) Fr. as a possible marker species of the effect of calcareous amendments due to the easy identification of its ECMs and the appearance of its carpophores around the trunk of its host trees. Elsewhere, Jonsson et al. (1999) and Rineau et al. (2010a) did not observe any relation between the biomass of the ECM mycelium and the production of their fruiting bodies; these same authors also report that this lack of correlation hinders the work of ECM sampling. García-Montero et al. (2009) in the field of truffle cultivation. These authors showed that the application of these amendments in plantations of Tuber melanosporum Vittad. and T. brumale Vittad. associated to Quercus spp. caused a rapid and significant rise in truffle production. However, they pointed out the need for exhaustive studies before applying calcareous amendments in truffle production, owing to lack of knowledge on the potential long-term effects on soil properties and ECM communities. García-Montero et al. (2009) observed that accumulations of Ca and finely divided calcium carbonate (active lime) occur in the rhizosphere of trees mycorrhized by several truffle species (Tuber melanosporum and T. brumale). García-Montero et al. (2009), therefore, that the ECMs of both these species cause a natural process which is equivalent to "calcareous amendments" to favour their mycorrhization and fruiting. In contrast, low levels of exchangeable Ca and/or soil pH cause a slowdown in the development of summer truffles (T. aestivum Vittad.) (Wedén et al., 2009). Furthermore, Aponte et al. (2010) report that high levels of Ca and soil pH observed in some natural populations of Quercus suber L. and Q. canariensis Willd. bear a significant relation with low levels of diversity in the ECM species that colonise them. All these findings suggest that soil Ca is associated with the dynamics of the ECM fungal communities. When Ca is present in low concentrations in the soil, several species of ECM fungi increase the mobilisation, transport and absorption of Ca by the host trees. These observations explain the finding in experimental plots that Ca concentrations are greater in ectomycorrhized trees than in trees without ECM fungi, when Ca soil availability is low. In these experiments, several authors have shown that the rhizosphere of the ectomycorrhized trees reveals (1) the formation of calcium deposits in the roots, (2) an increase in soil pH, and (3) increased calcium in the litterfall deposited on the soil. Furthermore, different species of ECM fungi can accumulate different amounts of Ca in their mycelium, and as the mycelium of the ECM fungi gradually dies, the accumulation of Ca present in its hyphae are mixed with the soil, thereby increasing the amount of available Ca (Andersson et al., 1996; Aroncena and Glowa, 2000; Zambrano et al., 2009). Several authors propose the term "rock-eating" to describe the formation of micro-channels (3 to 10 µm in diameter) made by the ECM hyphae in feldspar and hornblende rocks rich in K, Ca and Mg (Jongmans et al., 1997; Van Breemen et al. 2000a; Blum et al., 2002; Hoffland et al., 2003; Van Schöll et al., 2008). Wallander et al. (2003) and Smits et al. (2012) have demonstrated that the meteorization of apatite increases with the activity of ECM fungi. 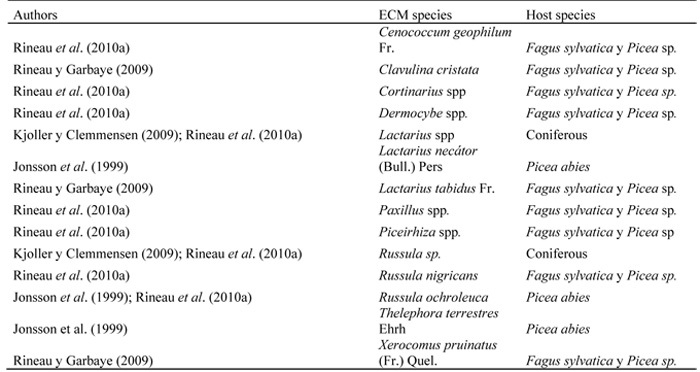 These authors indicate that these "rock-eating" processes allow ECM fungi to extract Ca and other nutrients from rocks. This rock-eating process has not been associated with any types of mycorrhizas other than ECMs. Hoffland et al. (2003) and Van Schöll et al. (2008) report that endomycorrhizal fungi have very little capacity to absorb Ca from rocks. Blum et al. (2002) describe natural populations of Acer spp. associated to endomycorrhizas that have a low capacity to access soil Ca, even though this tree species is highly sensitive to Ca deficit. Hoffland et al. (2003) and Van Schöll et al. (2008) also rule out the involvement of the hyphae of arbuscular fungi in rock-eating processes. In this regard, arbuscular mycorrhizal association plays a key role in the sustainability of terrestrial plant ecosystems, in particular those presenting limitations for the establishment and subsequent growth of plants (Borie et al., 2010). However, a number of authors consider it unlikely that ericoid and saprophytic fungi are involved in these rock-eating processes (Jongmans et al., 1997; Hoffland et al., 2003; Van Schöll et al., 2008). Rock-eating processes of ECM fungi seem to be associated to a deficit of certain nutrients (K, Ca and Mg) in the soil (Van Breemen et al., 2000a, 2000b; Hoffland et al., 2002; Wallander et al., 2006; Van Schöll et al., 2008). These rock-eating processes begin with the appearance of small cracks or etch-pits on the rock surfaces caused by the secretion of acids (succinate, citrate, oxalate, formate and malate) from the hyphae of ECM fungi (Jongmans et al., 1997; Hoffland et al., 2003). The density of the micro-tunnels observed in feldspar rocks is correlated with the amount of fine roots existing in the rhizosphere (Hoffland et al., 2003). In certain soils, in one year it is estimated that an average of 166 m of micro-tunnels can be formed per dm3 of rock (Van Breemen et al., 2000a). Van Schöll et al. (2008) indicate that there is a different concentration of the ECM hyphae in direct contact with the rock depending on its mineralogical composition. There is an increasing abundance of hyphae in rocks with a mineral concentration following the gradient: Na/Ca-feldspar > K-Feldspar > quartz. With regard to their position in soils, the greatest rock-eating activity and formation of micro-tunnels by the ECMs occurs in the upper part of the E horizons (Hoffland et al., 2002; Hoffland et al., 2003; Van Schöll et al., 2008). Blum et al. (2002) indicate in regard to the soil-ECM-tree system that rock-eating processes explain the significant quantities of Ca observed in the leaves of mixed conifer and broadleaved forests in Ca-poor soils. These authors note that the Ca accumulated in the leaves came from apatite rocks. Zambrano et al. (2009) observe that various roots colonised by ECMs revealed accumulations of calcium oxalate crystals (CaOx), with a greater abundance (and larger crystals) than in roots without ECMs. These authors also indicate that the amount of Ca2+ and oxalic acid available in the soil of the rhizosphere determines the size of the CaOx crystals. A number of authors report that these accumulations of CaOx are concentrated preferentially on the tips of the ectomycorrhizas and on the hyphae of their fungi, in response to the high concentrations of calcium in the soil and/or to the abundance of rocks with apatite minerals (Aroncena et al., 2001; Wallander et al., 2003; Zambrano et al., 2009; Rineau and Garbaye, 2010; Smits et al., 2012). Specifically, it has been observed that ECM fungi with extramatricial mycelium such as Piloderma croceum Erikss. & Hjortst. accumulate a greater amount of CaOx crystals than fungi without extramatricial mycelium such as Tomentellopsis submollis Svrcek. (Weigt et al., 2011). The morphology and distribution of CaOx crystals vary with diverse ECM morphotypes. In the case of Piloderma species, differences were found between the quantities of CaOx accumulated in the rhizosphere on plots studied in the field, and the rhizosphere in plants in the laboratory. This observation was related to the higher number of roots counted in the natural environments in the study (Aroncena et al., 2001; Wallander et al., 2003; Tuason and Aroncena, 2009; Zambrano et al., 2009). There is also a relationship between the formation of CaOx crystals and the abundance of P in the soil; thus when P was found in limiting conditions for the rhizosphere, the abundance of CaOx crystals formed in the ECM hyphae depended on the level of available soil Ca (Mrnka et al., 2009). A significant relation was observed between the relatively high concentrations of Ca (5mM) and low concentrations of P (0.1 mM) in the soil, and the accumulation of high quantities of CaOx in the rhizospheres. However, in soils with high levels of P, the formation of CaOx crystals was abundant in relation to all values of soil Ca (except in cases where there was no Ca) (Wallander, 2000; Tuason and Aroncena, 2009). Ca accumulation has been observed to occur in the root after calcareous amendments, linked to its increasing concentration in the soil, and according to Andersson et al. (1996), the increased calcium in the roots is distributed throughout the whole of the root system, with no differences noted between the fine roots and the rest; whilst Bakker et al. (2000) observed a significant effect of calcareous amendments on root development in Quercus petraea and Q. robur, which depended on the dose, the type and the age of the plants, and the time elapsed between the amendments and the root sampling. Ostonen et al. (2009) found that in ECM host trees, the diameter of the rootlets increases in relation with the concentrations of available soil Ca and N.
In a study of the concentration of various elements present in the roots in several forests of Fagus sylvatica, Fraxinus excelsior L. and Tilia sp. in central Europe, Lang and Polle (2011) and Mrnka et al. (2009)noted that root biodiversity plays a key role in the concentrations of root Ca, K, P, Mg and Fe. Thus the concentration of Ca found in the rhizosphere of Fagus sylvatica was significantly higher in areas where the roots of the tree were growing alongside the roots of other species. Jentschke et al. (1998) and Zambrano et al. (2009) indicate that the absorption of soil Ca through roots is depressed by the abundance of soil ammonium, K, Mg and Al, and by low pH values. Weigt et al. (2011) observed that in various seedlings ectomycorrhized with Tomentellopsis submollis the Ca concentrations in the stem shoots were greater than the shoots in the seedlings ectomycorrhized with Piloderma croceum. In contrast, the roots ectomycorrhized with P. croceum had a higher amount of Ca than the roots ectomycorrhized with Tomentellopsis submollis. Ba et al. (2002) and Mrnaka et al. (2009) report that ECM fungi increase the content of nutrients (Ca, N, P, K) in the leaves of certain trees. However these authors also observed a delayed biomass development in these ectomycorrhized trees. Other authors have noted a positive correlation between levels of available soil Ca (associated to experimental calcareous amendments), and Ca concentrations found in the needles of various Pinus spp. and the leaves of Betula spp. (Andersson et al., 1996; Casarin et al., 2004; Borja and Nilsen, 2009). However, Zhang and George (2002) report that in various plots of Picea abies no correlation was detected between Ca concentrations in their needles and the calcareous doses added into the soil. These authors suggest as an explanation that soil Al acts as an inhibitor of Ca absorption by Picea abies. In this regard, Meriño-Gergichevich et al. (2010) indicated that, as result of the negative effects of toxic Al, root metabolic processes, such as water and nutrient absorption, are disturbed with a concomitant decrease in Ca uptake. Blum et al. (2002) determined that the amount of Ca measured in the leaves of trees is significantly related to the Ca extracted and mobilised from feldspar rocks by ECM fungi colonising those trees (through rock-eating processes). 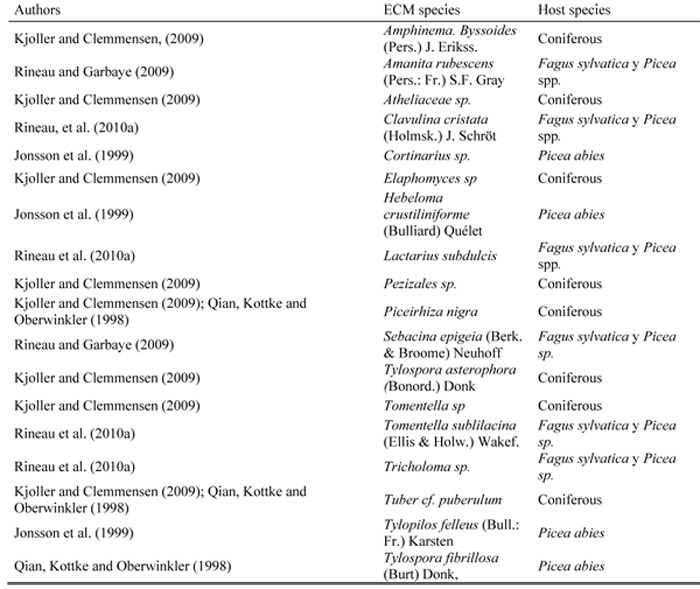 These observations vary based on the species of ECM fungi in question. Mrnaka et al. (2009) observed that the levels of Ca increased significantly in the needles of populations of Picea abies that were mycorrhized by Hebeloma bryogenes Vesterh. and Setulipes androsaceus L.
Other authors confirm that the Ca present in the leaves may trigger changes in available soil Ca content (when the litterfall is incorporated). Thus the soil is modified by the interactions between different tree species and species of ECM fungi, as each species has a different capacity for absorbing and retaining Ca (Blum et al., 2002; Hobbie et al., 2006; Aponte et al. 2010). Specifically, Aponte et al. (2010) indicated that certain deciduous species such as Quercus canariensis incorporate more soil Ca in their leaves than other perennial species such as Q. suber. The same pattern has been observed by other authors in natural populations of Betula pendula Roth. (deciduous species) versus Picea abies (perennial species) in plots treated with calcareous amendments (Andersson et al., 1996). Aponte et al. (2010) also explained that the differences observed between Ca accumulated in the leaves of one deciduous tree species compared to the leaves of one perennial tree species could account for the variations in the amount of available soil Ca (associated to the litterfall) at the base of deciduous trees in comparison with the soil Ca at the base of perennial trees. The litterfall from Quercus canariensis supplies 81% more Ca to the soil than the litterfall from Q. suber. These authors point out that these differences in the Ca concentrations of the litterfall can lead to selective environmental conditions that would modify the composition of ECM fungal communities. Aponte et al. (2010) confirmed the existence of a negative relationship between the taxonomical biodiversity of ECMs and the Ca concentration in the litterfall from their host trees. In contrast, Borja and Nilsen (2009) did not find any significant relation between the amount of nutrients present in the aciculae of Pinus sylvestris and the degree of colonisation of their ECM communities. The scarcity of knowledge on the interactions between Ca and ECM fungi has led several authors to highlight the need for new studies on (1) the interaction of litterfall with ECM fungi communities (Aroncena and Glowa, 2000), (2) the interaction of soil Ca and ECM communities (García-Montero et al., 2009), (3) the accumulation of CaOx crystals associated to ECMs (Tuason et al., 2009), (4) the interaction of Ca and tree roots (Lang and Polle, 2011), and (5) the interaction of ECM rock-eating processes in the nutrition of their host trees (Van Schöll et al., 2008). The present review reveals that the primary effects of calcareous amendments on ECM fungi communities are, in general: (1) a decrease in their biodiversity (particularly in acidophilic fungi), and (2) an increase in the total colonisation of the roots of host trees by the ECM fungi. Calcareous amendments have varying impacts on ECM communities according to the species and morphotypes of the ECMs, but do not generally have any significant effect on the production of fruiting bodies. Similarly, in experimental plots subject to acid rain, the decrease in soil pH was not found to influence the production of ECM fungi (Agerer et al., 1998). However, the increase in pH and Ca associated to the litterfall from the trees causes variations in the dynamics of ECM fungal communities, and in some cases, a decrease in their carpophore production. Thy hyphae of ECM fungi are capable of counteracting the lack of Ca and other nutrients in the soil through rock-eating processes. Jongmans et al. (1997) and Van Breemen et al. (2000) report that the rock-eating processes of ECMs could explain the continued productivity of European forestry in areas affected by acid rain in recent decades. These authors therefore consider the application of calcareous amendments to possibly be unnecessary in acid soils in these regions of Europe. Certain ECM fungi are capable of accumulating Ca (or its salts) in the rhizosphere. However, there is little knowledge of the causes that provoke these natural accumulations of Ca. Tuason and Aroncena (2009) and Smits et al. (2012) proposed that these accumulations of Ca in the rhizosphere could be a precautionary mechanism by ECMs when their soil concentrations decrease. However, the rock-eating activity of ECMs would make it unnecessary to deploy mechanisms for the accumulation of Ca in order to prevent deficiencies (Wallander et al., 2006; Van Breemen et al., 2000a). Casarin et al. (2004) suggests that the natural accumulation of Ca in the rhizosphere of Pinus pinaster Ait. could be a "barrier-effect" mechanism by the ECMs that would protect the tree by preventing the absorption of Ca by its roots. Whitney and Arnott (1987) also attribute the accumulations of CaOx to a process of protection of the rhizosphere in response to possible attacks by microbes or by soil fauna. (1) Earthworms may produce the same effect as calcareous amendments on forest rhizospheres, as on the one hand (1) they homogenise the soil, thereby increasing its pH (Qianet al., 1998; Rieneau and Garbaye, 2009); and furthermore (2) earthworms cause an increase in soil calcium carbonate from their calciferous glands (which they all possess). These glands produce a net fixation of C in the soil (from fresh organic matter and CO2) and an increase in soil pH (Canti, 2009; García-Montero et al. 2013). These actions by earthworms would have a similar impact to the effects described for calcareous amendments, as they would similarly modify the nutrients of the forest rhizospheres, alter their ECM communities and modify the growth patterns of the roots. (2)Certain populations of ECM fungi have the capacity to accumulate Ca in the rhizosphere, which could provoke chlorosis in their host trees and favour their mycorrhization according to a feedback model proposed by García-Montero et al. (2009). In conclusion, the present work underlines the fact that soil calcium (and its salts: carbonates and oxalates) have an impact on the interaction between ECM fungi and host trees. It particularly highlights the impact of calcium on (1) growth patterns in roots and (2) ECM population dynamics. Another noteworthy finding is the importance of Ca cycles (1) in relation to its accumulation and mobilisation by leaves and litterfall, and (2) due to the rock-eating processes associated to ECMs. However, there are still many unanswered questions with regard to the cause-effect relationships between the interactions of Ca and the soil-ECM-plant system in Mediterranean and temperate forests. A greater knowledge of these interactions would have positive repercussions for reforestation projects, soil management actions in these forests, commercial production and harvesting of ECM fungi, and the economy of the various rural areas in these regions.